VA Buyers Agent Specialists are rare in Orange County, CA. The VA loan program is not widely used in Orange County compared to other areas like San Diego, where Camp Pendleton is located. Because Orange County does not have a large active military base, there are not as many real estate agents who are comfortable working with a buyer using VA financing. However, Orange County does have a large population of retired military Veterans who do want to take advantage of their VA benefit to buy a home for up to $679,650 with No Down Payment. So why should you seek out a VA Buyers Agent? As you may have noticed, 2018 has been an extremely competitive market. Multiple offers are everywhere. Unless real estate agent knows the in’s and out’s of VA financing and understands what it takes to get a VA offer accepted, you may be spinning your wheels making offers on homes only to get rejected for no apparent reason. In many cases, the Listing Agent doesn’t understand the VA loan process or has the “old rules” of VA financing stuck in their head. It used to to be that the buyer could not pay “non-allowable” closing costs. Many Listing Agents believe that their seller will be forced to pay the VA loan buyers closing costs, which is not true anymore. There are many questions that come along with a VA purchase that are slightly different than a Conventional loan, which makes the purchase contract and negotiation process different as well. And this is why it is important to use a VA Buyers Agent when you are preparing to purchase a home in Orange County while using a VA loan. Your VA Buyers Agent will have the knowledge to quickly alleviate any concerns the Listing agent and seller may have with the VA loan program. Orange County is an awesome place to live. With that awesomeness comes fairly high home prices. But this is also the reason that VA allows 100% financing to $679,650, which is a higher limit than most counties. For example, the 100% financing limit in Riverside and San Bernardino counties is $453,100 (in 2018). As you begin your home search you will find that many desirable properties are condos rather than Single Family homes. With some properties the distinction between condo and Single Famly home is slight. Some condos look like single Family detached homes. And some homes that look like condos are actually Single Family, even if they are attached. Figuring out which properties are eligible for VA financing is not easy, especially if you are not working with a VA Buyers Agent. Single Family homes are always eligible for VA financing. But a condo must be in a VA approved condo complex. And this is where it gets tricky. Determining whether a condo is in a VA approved condo complex is not easy. It takes time and research. A VA Buyers Agent has already spent time researching what properties are VA approved and which are not, which will save their VA buyers time and frustration. There is an easy way to find VA approved condos in Orange County. And there is a hard way. A VA Buyers Agent knows the easy way. The Multiple Listing Service (MLS) is not tied in with the VA website which has the list of VA approved condos in each city and county throughout the country. The Listing Agent “could” make a not on the listing that they will accept VA financing, but they rarely happen because, in many (if not most) cases, the Listing Agent is not even aware if their condo listing is VA eligible. From my experience, in many cases, the HOA management company is not even aware of the answer to this question. To make matters worse, the VA website doesn’t even list most condo projects by their name. Most VA approved condos are listed by their Legal Tract Number. Cross-referencing Legal Tract numbers with project names is not easy. But for a VA Buyers Agent who has already done this research and has the VA approved Tract number lists for each city in Orange County, it is quick. 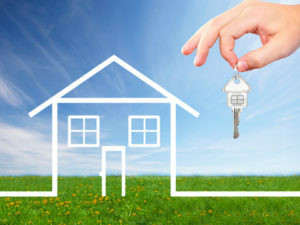 www.OrangeCountyVeteransHomes.com makes it easy for a home buyer to find VA approved condos for sale in Orange County. 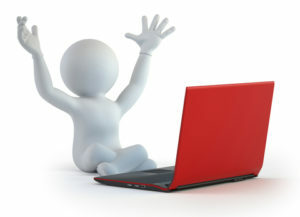 Simply click on the link for the city you are interested in and the results will come up. For example, below are the links to a few cities in Orange County. Authored by Tim Storm, an Orange County VA Loan Officer specializing in VA Loan. MLO 223456. – Please contact my office at Fairway Independent Mortgage Corporation. My direct line is 949-829-1846. www.OrangeCountyVALoans.com. I will prepare custom VA loan scenarios which will be matched up to your financial goals, both long and short-term. I also prepare a Video Explanation of your scenarios so that you are able to fully understand the numbers BEFORE you have started the loan process. Do you know how to find VA approved condos for sale in Orange County, CA? There is a hard method, which is the way the most VA loan buyers and their agents go. But there is an easy method. And the difference between the hard way and the easy way is so drastic that you would think everyone would use the easy method. Why don’t they? 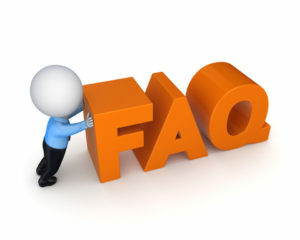 Why is it Important that the Condo be in a VA approved Condo Project? If you plan to use VA financing to purchase a condo, then VA requires the condo project to be approved prior to closing the loan. The condo approval process is tedious, there is an expense, and takes time. Most sellers are not willing to wait around for anywhere from 30 to 90 days to find out if VA will even allow a loan to close on their home. For that reason, if you are searching for a Condo to buy and you are using VA financing, you will want to limit your search to only those condos that are already in a VA approved condo complex. If the condo project is approved, it means that VA has already reviewed the associations budget, CCR’s, Articles of Incorporation, insurance, and ownership percentages (investor versus owner-occupants). If it is not approved then either VA reviewed and rejected the condo association, or the project has not been submitted for approval. First, here is a quick summary of what most Veterans and their agents do to find condos that are VA approved. The real estate agent or Veteran will look at ALL condos that meet their parameters, sometimes sorting through hundreds of properties. They will carefully view each property and narrow the list down to the 5 or 10 properties they like. Then, the real estate agent will try to determine if any of the properties are eligible for VA financing. Since most condo projects are NOT VA approved, this is a frustrating process and a waste of time. So now let’s show you the easy way. First, work with a real estate agent and lender who actually specialize in working with Veterans and understand how to quickly narrow the VA approved condo search to only those condos projects that are already VA approved. An experienced real estate agent will already have a list of the VA approved condo projects and will quickly be able to provide a list of VA approved condos for sale in whatever city the Veteran is interested in. Instead of sending the Veteran a list of 100’s of condos, most of which are not VA approved, the EASY METHOD involves the Veteran receiving a list of VA Approved condos to choose from. This saves the frustration of finding out that 5 of the properties you are interested in are not even eligible for VA financing. 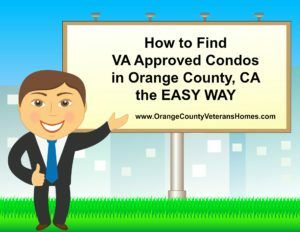 Of course, using www.OrangeCountyVeteransHomes.com is a great way to begin the process of finding what VA approved condos are for sale. Just click on the city you are interested in and check out the results. The results are listed in order of highest prices to lowest price. It is still important to have an experienced VA specialist real estate agent double check to make sure the condo you are interested in is still on the VA approved list because sometimes VA has reason to suspend an approval. The VA Loan limit for 100% financing in Orange County in 2018 is $679,650. This means that as a VA loan eligible Veteran, you can buy a VA approved condo or Single Family home for $679,650 with no down payment. Still, there are closing costs and prepaid expenses involved in every purchase and having a solid estimate of those costs before you make an offer is a critical step in purchasing a home. The closing costs and prepaid expenses involved in purchasing a $650,000 property can easily be more than $10,000 and cannot be financed into the loan. 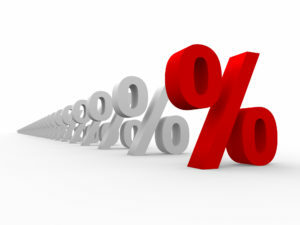 There are ways to use “Lender Credit” to cover the costs by adjusting your interest rate higher. At times, and depending on if the market is a “sellers” market or a “buyers” market, it is possible to negotiate to have the seller pay some or all of the closing costs. In a seller’s market, which is what Orange County has been in for the first half of 2018 (and since 2012), it is difficult to get a seller to pay closing costs. Think about it. If there are multiple offers on a home, what are the chances of a seller accepting an offer where they have the pay for the buyers closing costs? Know your numbers before you make an offer. Get a solid estimate as part of your VA loan PreApproval before you start looking at homes. Do you Know What Price You Should Be Searching For? The biggest disconnect that most home buyers have at the beginning of the home buying process is understanding the connection between payment and purchase price. If your income is $40,000 per year then you shouldn’t be looking at homes in the $650,000 price range. Understanding the numbers early in the process is critical, and to do that you should be working with a VA loan specialist. A loan officer who specializes in financing will be able to prepare custom loan scenarios based on your qualifications and payment comfort range. You’ll also be able to get PreApproved for your VA loan before you begin making offers. PreApproval for a VA loan is Free, whether you are ready to buy now or need to wait 12 to 24 months. Authored by Tim Storm, an Orange County VA Branch Manager and Loan Officer specializing in VA Loan. MLO 223456. – Please contact my office at Fairway Independent Mortgage Corporation. My direct line is 949-829-1846. www.OrangeCountyVALoans.com. I will prepare custom VA loan scenarios which will be matched up to your financial goals, both long and short-term. I also prepare a Video Explanation of your scenarios so that you are able to fully understand the numbers BEFORE you have started the loan process. Finding VA approved properties to buy in Orange County is not difficult when you are working with local VA Experts. Please feel free to give us a call, or send an email anytime and we will contact you as soon as possible. Contact Tim Storm at 949-640-3102 for your VA loan needs and Theresa Smith at 949-422-8580 for your real estate needs. Theresa helped me locate and buy the exact kind of condo I was looking for. Her patience and professionalism was truly appreciated and her understanding of buying a home through the VA was thorough. I wouldn’t hesitate to recommend her. Tim & Theresa demonstrated a high level of experience with the VA loan process that enabled us to be competitive in this market.. Your quick responsiveness with the Seller’s agent and confidence in our ability to secure a loan, is, I believed, what edged us out. Tim Storm, MLO 223456 "VA Loan Specialist"